Long, dark winter nights and stormy weather have us craving a roaring fire, fluffy slippers, and a soft blanket to curl up under. 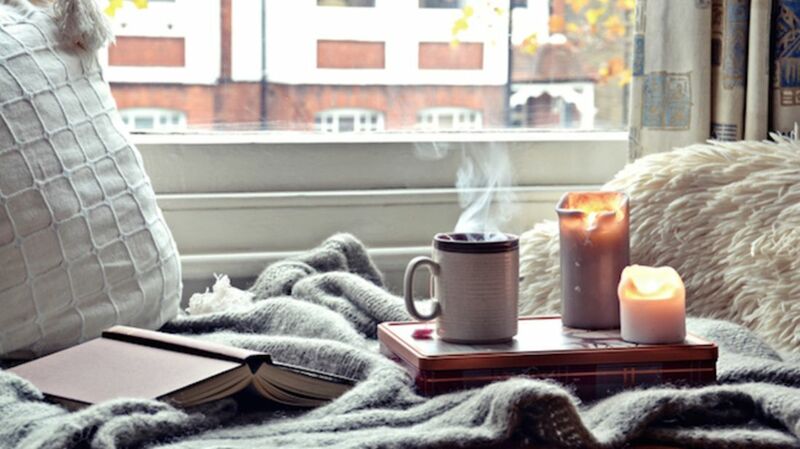 As the Danes would say, we want to get hygge. Hygge (pronounced hoo-gah) is the Danish concept of coziness and intimacy—as one tea company puts it, hygge is "taking pleasure from the soothing, ordinary, and inexpensive things in life"—and it has made its way across the Atlantic. To achieve optimal hygge in your own home, grab a warm drink, put on your chunkiest sweater, and check out the below tips. A flickering fire can instantly make any space feel intimate. If you don't have a fireplace in your home, create that warm and cozy vibe by arranging candles of different sizes and shapes into a cluster, says Kayleigh Tanner, owner of the U.K.-based blog Hello Hygge. “My favorites are Yankee Candles in scents like cinnamon and vanilla, but a bag of cheap tea lights will do the trick just as well,” Tanner says. Take a cue from nature (which is innately relaxing and stress-busting) and add some greenery to your home. Can't keep plants alive? Add natural materials like leather, stone, and wood to your space. Unless you have a dimmer, overhead lights are often too bright to create the homey feeling you're after. So turn off that light and rely on table lamps instead, Tanner says. Cozy spaces might be small, but that doesn't mean they're cluttered. Kate Marengo, founder and president of Interior Chicago, says you can’t relax in spaces that are overwhelming. So before you add your hygge touches (candles, a throw, books), take a page from Marie Kondo's book and strip away any extraneous items that don't bring you joy. 5. REACH FOR SOMETHING SOFT. Texture is a big part of hygge, says Pia Edberg, Vancouver-based author of The Cozy Life. Edberg suggests surrounding yourself with soft items like knitted fleece throw blankets, fluffy pillows, shag rugs, and comfy furniture. 6. SURROUND YOURSELF WITH OBJECTS THAT TELL A STORY. "There are studies about how hygge in Denmark shies far away from consumerism,” Edberg says. Instead of stocking up on mass-produced items, decorate your home with furniture and accents that are meaningful to you. Edberg says this could mean the items were given to you as gifts, you purchased them on your travels, or they are antiques with a rich history. 7. KEEP THE HOT DRINKS COMING. Tanner recommends making your tea kettle your new best friend. She digs Hoogly Tea, a British company that makes hygge their business by selling creative tea blends such as Vanilla Chai, Around the Fire, and Marzipan. Not a tea person? Cocoa or coffee will also do the trick. Time with family or friends, especially while sharing a great meal, is essential to the hygge philosophy, so you’ll need a great dining room table. Danes love a great wooden table and hand-crafted chairs (many will pass down an Arne Jacobsen or a Hans Wegner chair from generation to generation), but any dining room set will do—the important part is spending mealtimes together, says Helen Russell, author of The Year of Living Danishly. 9. SCRUB-A-DUB-DUB, HEAD TO THE TUB. “Not many people think about the bathroom when they’re making their home cozier, but think about making a more relaxing environment for the next time you take a soothing bath,” Tanner says. You can do this by lighting a few candles and integrating essential oils and bath products with relaxing scents into your routine. Big, fluffy towels and a quality bathmat are also great additions. Technology is your secret weapon in making your home cozy, says Carly Pokornowski Moeller, owner and registered interior designer at Unpatterned in Chicago. Wireless speakers can help you use music to set the right mood throughout your home. And, Pokornowski Moeller says, adding a total smart home system (like Nest) can allow you to change the temperature or turn off the lights in any room right from your smartphone. This way you can stop running from room to room to adjust and can just be present.